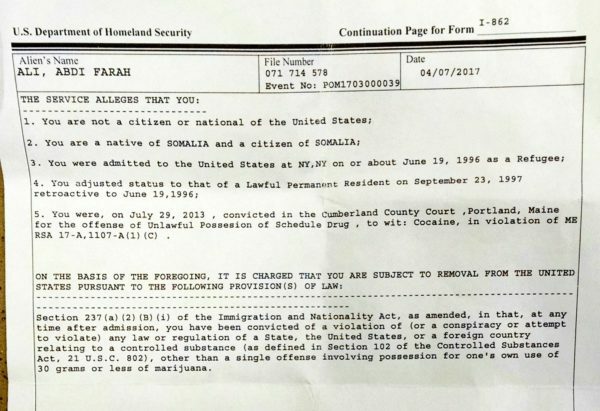 This is the form U.S. Immigration and Customs Enforcement officials provided to Abdi Ali when they took him into custody at the Cumberland County Courthouse in Portland on April 6, 2017. Late last month, Gov. Paul LePage tried to pardon a dog that had been ordered euthanized after it killed one dog and attacked another. Despite the governor’s intervention, a judge ruled Tuesday that state law requires that the husky be put down. That ruling has since been appealed, sparing Dakota for now. While Dakota awaits resolution, the governor could use his power to pardon people to right a real injustice. 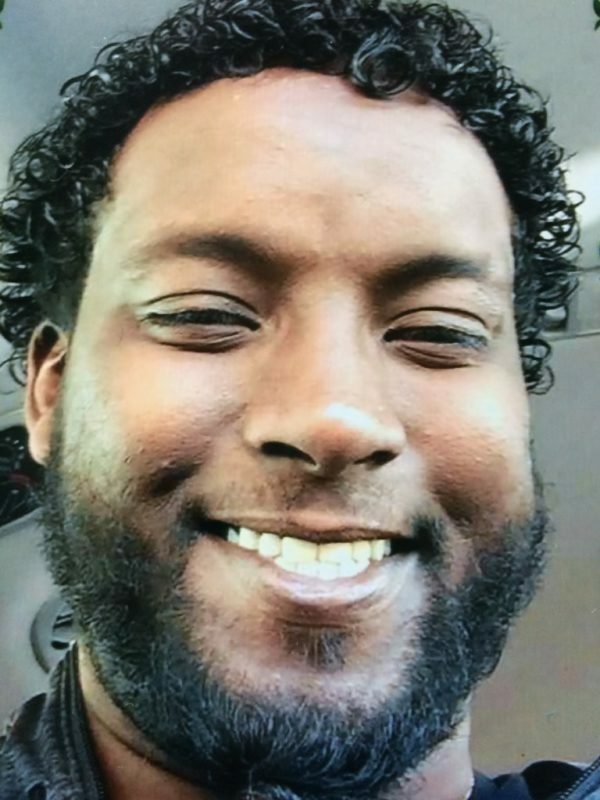 Abdi Ali has lived in the United States for more than 20 years. He came here from Somalia with his family as a 7-year-old refugee in 1996. He became a permanent legal resident a year later. Immigration and Customs Enforcement agents grabbed Ali inside the Cumberland County Superior Court last week. It was the first such ICE action in Maine although the agency has been arresting immigrants at courthouses around the country. Ali was at the court to be arraigned on a drunk driving charge and to meet with an attorney. He is now being held at the Cumberland County jail. ICE is seeking to deport Ali for a 2013 misdemeanor drug possession conviction in Maine. He served five months in jail for that crime. Ali is far from perfect. He has a police record dating back to 2009 and has been jailed for other misdemeanor offenses. Ali is now caught up in the Trump administration’s efforts to deport immigrants who have committed crimes. Maine Attorney General Janet Mills and 179 Maine attorneys have objected to ICE seizing immigrants at court houses. LePage, who has the authority under the state constitution to pardon people convicted of crimes in Maine, could pardon Ali of the 2013 drug crime so he is not sent back to a country that he doesn’t remember, where he is not fluent in the language and where his life could be in danger. The Department of State, after all, warns Americans not to travel to Somalia. Unfortunately, we don’t expect the governor, who has blamed asylum seekers, refugees and people he calls “illegal aliens” for crimes and diseases, to show mercy and intervene in Ali’s case. Nor do we expect the Trump administration, which wrongly asserts that immigrants are dangerous criminals, to be deterred from its deportation spree. But there is precedent for such compassion. In 2011, then-Gov. John Baldacci pardoned two men who faced deportation because of crimes they had committed in Maine. Both men, one from Cambodia and one from England, came to the United States as young children. This factored heavily into the former governor’s decision to pardon them. Touch Rin Svay, who was born in a refugee camp in Cambodia, was convicted of manslaughter after a 2001 drunk-driving crash that killed his sister. Paul Blakesley had been convicted of burglary and marijuana cultivation, twice. “Neither of these men would have received pardons had they not been facing deportation to countries in which they have no ties or connections and if the consequences of that deportation would not have added new victims to their cases,” Baldacci said in a statement in January 2011. The same standard should apply to Ali. The punishment of being removed from his home and family and sent to a country that is unfamiliar and where he will be in danger does not fit his misdemeanor crimes. Rather, it is cruel and unusual. More Maine kids need to be tested for lead. A mandate isn’t the only solution.